fixed and have mahogany frames and white mahogany panels, and are upholstered with a soft piled material having a pleasing pattern in red, black and gold. The ceiling panels are white lincrusta with a raised pattern tinted terra cotta; and there is a carpet on the floor to match. The 3rd class is similar in general design, but the woods used are teak for the frames and fascias, anf light wainscot oak for the panels. The seats are upholstered in brown and gold combination rep. The ceiling panels are lincrusta with the pattern coloured buff, and the floor is covered with linoleum. All the side lights are fixed and thereby much trouble is saved, and the carriages are kept much cleaner. The carriages are, however, adequately ventilated by “Torpedo” air extractors placed in the positions indicated on the drawings, and there are long flap ventilators opening upwards, and which may be regulated by the passengers. But in addition, each saloon is fitted with two small fans for agitating the air, and which are worked by electricity taken from the electroliers. 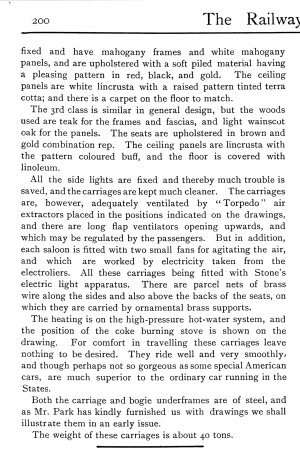 All these carriages being fitted with Stone’s electric light apparatus. There are parcel nets of brass wire along the sides and also above the backs of the seats, on which they are carried by ornamental brass supports. The heating is on the high-pressure hot-water system, and the position of the coke burning stove is shown on the drawing. For comfort in travelling these carriage leave nothing to be desired. They ride well and very smoothly, and though perhaps not so gorgeous special Americal cars, are much superior to the ordinary car running in the States. Both the carriage and bogie underframes are of steel, and as Mr. Park has kindly furnished us with drawings we shall illustrate them in an ealry issue. The weight of these carriages is about 40 tons.